The rule brought forward by member of Scottish parliament Tavish Scott applies to maps published by government bodies, although exceptions can be requested. 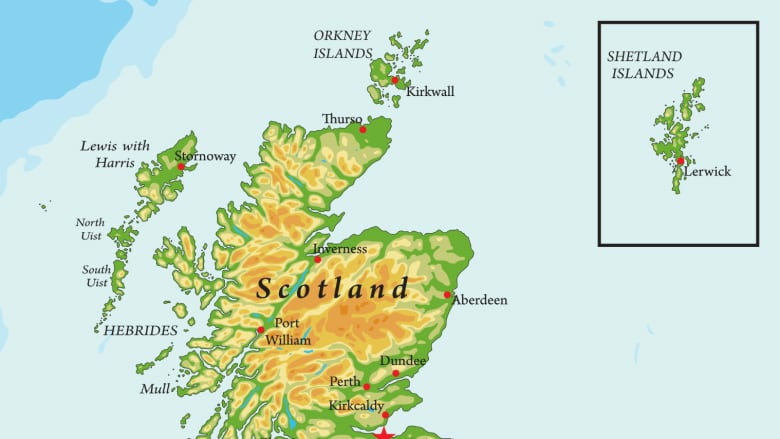 Government bodies in Scotland aren't allowed to put Shetland in a box on maps anymore. Tavish Scott, a Shetland member of the Scottish Parliament, brought forward the mapping requirement as a part of the Islands (Scotland) Act. It reads: "the Shetland Islands must be displayed in a manner that accurately and proportionately represents their geographical location in relation to the rest of Scotland." The U.K.'s mapping agency spoke out against the rule, telling the BBC the boxes allow for more detail and avoid maps that are "mostly sea." Scott spoke to As It Happens host Carol Off about why he thinks it's about time for the new rule. Why did you want to get Shetland out of the box? The many government publication maps, and other ways in which Shetland has been exhibited over the years, has usually had the islands placed on a map in a box in the incorrect geographical position. Many islanders, if not all of the islanders, feel pretty upset by that and were fed up with the irritation of being in the wrong place. Some parliamentary legislation was available earlier this year and I was able to move some changes to that legislation so as to make sure that in future Shetland, as you say, is not in the box, but in its correct position. Is there a reason for putting Shetland in a box? I guess the reason is that we're 200 miles north of the Scottish mainland and therefore a correct map has to have a fair bit of sea. I don't have a problem with that because we live on islands, we depend on boats, we have a huge fishing industry … so it seems to me a bit strange not to have the sea as part of the geography of Scotland. Cartographers who are opposed to this ban say that if maps had Shetland where it should be there would be no details. They actually use these boxes to avoid maps that are mostly water. Well, hey-ho. My heart bleeds for them. We live where we live. I think it's time that we were put in the right place and that's what islanders believe. As we say in Scotland, the central belt attitude — which is that Edinburgh and Glasgow are the centre of the universe and everywhere else should just be very lucky to be somewhere in their vicinity. I think we in Shetland take the view it's about time that we reverse that map. Instead of looking at it from the centre, if we looked at it from where we live that would make a pleasant change in the modern, digital world we live in. So .. we can put Shetland in the middle and put, what, Great Britain in a box? Absolutely. We have very good T-shirts that sell very well to tourists during our summer tourism season where exactly that happens. I wonder if this is good or bad for your tourism because, I guess, when people look at a map and they see Shetland in a box they think, "Oh, it's not so far away." But if you see it where it is, it really is quite a distance. Do you think that will dissuade people from making that journey? I think it probably cuts a bit both ways. I think people like to know where they're going. We have been very fortunate to have had a great television crime series, called Shetland funnily enough, that has been filmed in the islands ... and that has brought many visitors to the islands. In the Shetland series ... you really do see the beauty of the place and I'm sure that appeals to people — though they must presume that you have far more murders per capita than any other place in Scotland. We keep telling people it is just a story. It's not true. Do you think that other islands in a box ... [will] start lobbying to get out of their boxes? Good luck to them. I've certainly had a few emails and a few messages saying exactly that. From the islands in the very southwest off the English coast called the Scilly islands. They have the same problem. They invariably get put in a box. I think people who live there have the same view. They are where they are and that's an important part of why they're important. This conversation has been edited for length and clarity. Produced and written by Katie Geleff.